Soon after film came into existence, the term epic was used to describe productions that were lengthy, spectacular, live with action, and often filmed in exotic locales with large casts and staggering budgets. The effort and extravagance needed to mount an epic film paid off handsomely at the box office, for the genre became an immediate favorite with audiences. Epic films survived the tribulations of two world wars and the Depression and have retained the basic characteristics of size and glamour for more than a hundred years. Length was, and still is, one of the traits of the epic, though monolithic three- to four-hour spectacles like Gone with the Wind (1939) and Lawrence of Arabia (1962) have been replaced today by such franchises as the Harry Potter films and the Lord of the Rings trilogy. Although the form has evolved during many decades of existence, its central elements have been retained, refined, and modernized to suit the tastes of every new generation. The Encyclopedia of Epic Films identifies, describes, and analyzes those films that meet the criteria of the epic sweeping drama, panoramic landscapes, lengthy adventure sequences, and, in many cases, casts of thousands. This volume looks at the wide variety of epics produced over the last century from the silent spectacles of D. W. Griffith and biblical melodramas of Cecil B. DeMille to the historical dramas of David Lean and rollercoaster thrillers of Steven Spielberg. Each entry contains: Major personnel behind the camera, including directors and screenwriters; Cast and character listings; Plot summary; Analysis; Academy Award wins and nominations; DVD and Blu-ray availability; Resources for further study. This volume also includes appendixes of foreign epics, superhero spectaculars, and epics produced for television, along with a list of all the directors in the book. Despite a lack of overall critical recognition and respect as a genre, the epic remains a favorite of audiences, and this book pays homage to a form of mass entertainment that continues to fill movie theaters. 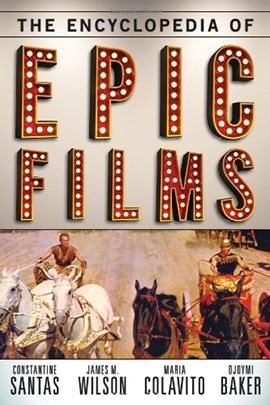 The Encyclopedia of Epic Films will be of interest to academics and scholars, as well as any fan of films made on a grand scale.